It’s been somewhat surprising, even given my own innate skepticism about practically everything, that for the last week or so there’s been very little compelling movie news — really very little that I could bring myself to even mention here. To be honest, I kind of liked that way. Much less time consuming and more fun to just throw trailers and stuff at you guys. The last 24 hours or so, however, have been a very different story. * I often wonder where George Lucas went wrong in a number of departments. Today he’s King Midas in reverse with actors — who else could actually make Samuel L. Jackson boring? — but he directed the very well acted “American Graffitti.” His first two “Star Wars” movies were imperfect but great, great fun — and he had the great good sense to bring in the best writers available, and a very strong director, for the second one. He insisted on doing the three prequels himself, however, and in my opinion and lots of other people’s, showed how borderline unwatchable a space opera could be. What went wrong? 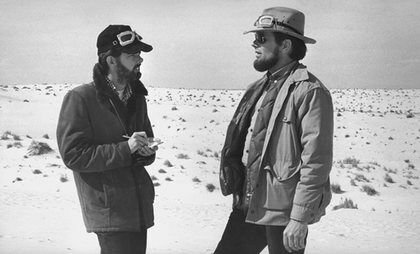 I don’t know but one thing that did happen to Lucas was the departure of producer Gary Kurtz, he of the Abe Lincoln beard who I honestly haven’t thought about in decades. Tags: 007, American Graffitti, Audrey Hepburn, Bugs Bunny, Daniel Craig, Deepa Mehta, Edward Norton, Emma Thompson, Endgame, Gary Kurtz, Generissimo Francisco Franco, George Lucas, Headlines, John Huston, Jonathan Franzen, Judge Dread, Leaves of Grass, Lucasfilm, Matthew Patel, Midnight's Children, Pete Travis, Road Runner, Salman Rushdie, Samuel L. Jackson, Scott Pilgrim vs. the World, Star Trek, Star Wars, Sylvester Stallone, Terminator, The Life and Times of Judge Roy Bean, The List of Adrien Messenger, Tim Blake Nelson, Time Magazine, Vantage Point, Who Framed Roger Rabbit? It’s the late 1980s in South Africa. The most important political prisoner of the 20th century, Nelson Mandela (a miscast Clarke Peters), is being readied for his release as brutal violence and unrest are reaching a boiling point. Realizing that civil war is very bad for its African interests, a powerful English gold trading firm sends a conscientious PR flack (Jonny Lee Miller) to set-up secret negotiations. 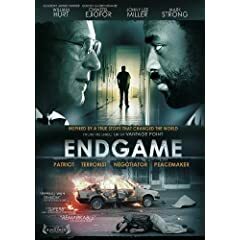 Will Esterhuyse (William Hurt), a centrist Afrikaner academic, is dragooned into going into those negotiations to act as a spy for the brutal neo-fascist white supremacist apartheid regime. Eventually, however, he finds himself actually forging common ground and heroically comes clean to the leader of the ANC delegation, future South African President Thabo Mbeki (Chiwitel Ejiorfor). Unfortunately, director Pete Travis (“Vantage Point“) tries to make what actually should be a rather traditional PBS production into an over-amped action thriller, despite the reality that the real “action” of this story amounts to several white guys and black guys sitting around talking. Travis’s disinterest in the actual content of the story, his irritating and pointless reliance on jarring editing and sound effects, and a hideous audio mix which often makes the dialogue impossible to understand without turning up the volume to painful levels, destroys the inherent drama of the story as well as strong performances from some great actors. It’s a crime because, “Invictus” notwithstanding, the story of how apartheid ended without the catastrophic bloodbath the world fully expected still demands to be told on screen.